Monday will see the first extraordinary meeting of Fifa since May's corruption scandal whipped through its senior ranks. There will be plenty on the agenda, including a possible announcement on some, or all, of its plans to reform the damaged organisation. What we will know for certain is when president Sepp Blatter's successor will be chosen. I'm told 16 December is still the preferred date. However Blatter's desire to stick around a while longer before departing may see the emergency Fifa congress - which will be attended by all 209 member states - slip to early 2016. Either way the clock is now ticking for those wishing to be the next leader of world football. So far there have only been a handful of declarations, principally from individuals who are well-intentioned but have little chance of winning. The big beasts of football politics are still to pounce. The reasons? Many are thought to be holding off because of concerns about the state of the organisation they will inherit. Others are simply waiting to see who makes the first move. Prince Ali Bin Al Hussein of Jordan, for example, may decide not to run again if Uefa president Michel Platini enters the race. That despite Ali polling 73 votes in May's ballot. Fifa is already involved in two criminal investigations. With the threat of further action and arrests still to come, the organisation is set to be mired in legal disputes for many years to come. But someone will have to lead once Blatter departs. The rules dictate presidential candidates must have been involved in football for two of the past five years. They then have to gain the support of five football associations in order to validate their place on the ballot paper. It's a difficult hurdle to clear - just ask Jerome Champagne and David Ginola, who both failed in their attempts to become qualified candidates in the election just gone. There are some, including the Premier League executive chairman Richard Scudamore, who would like to see a candidate untainted by past scandal and with a corporate track record come forward. Speaking to me earlier this month, Scudamore said: "The problem with the football politician is that it's all about votes. In some ways Fifa needs someone who can transcend that, who is a more unifying candidate. "Quite frankly, we need some new names and some new thinking. "It probably needs someone from one of the emerging nations or at least someone who is independent from what has gone on in the past." But the rules as they stand prevent anyone from outside football entering the contest. 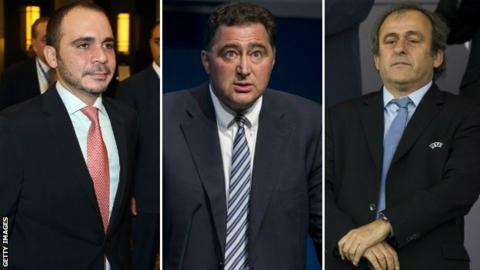 Much has already been said about the potential candidacies of individuals such as Platini, Champagne, Sheikh Ahmad Al-Fahad Al-Sabah, David Chung, Issa Hayatou, Ted Howard, Musa Bility and others. In due course, the field will thin out and the true contenders will come forward. But one man who hasn't been mentioned as a possible runner is Domenico Scala, appointed in 2012 as Fifa's independent head of audit and compliance. His position was spun by Fifa at the time as a crucial part of the ultimately botched reform process undertaken in light of several previous electoral and financial scandals. Fast forward to last month and it was the Swiss-Italian who was present when Blatter dramatically announced he would "lay down his mandate" and call for a fresh election. That day Scala spoke of how Blatter, in promising to resign, had "created an opportunity for us to go further than Fifa has before - to fundamentally change the way in which Fifa is structured". "Nothing will be off the table, including the structure and composition of the executive committee and the way in which members of the executive committee are elected," he added. "These steps will ensure that the organisation cannot be used by those seeking to enrich themselves at the expense of the game." It was a clear statement on the work he feels Fifa must now undertake. In another context, it would work well as a manifesto. Scala has backed up those words in recent weeks - most notably when Blatter tested the water on a possible resignation U-turn. "The times of flirting with the power are definitely gone," he said in a terse statement. "I call on all concerned - including Mr Blatter - to endorse in the interest of the reforms unequivocally the announced changing of the guard at the top of Fifa." There are clear reputational risks for Scala in being involved with Fifa given the crisis that has enveloped it. As such, his statement reminding Blatter that he needs to stick to his word is unquestionably part of a desire to remain untainted. However the strength of his declaration on the need for Blatter to go demonstrates that a big role in Fifa's new leadership team should not be discounted for him just yet. On paper he has all the attributes required to run a large, financially strong organisation given his strong corporate background. He knows Fifa's structural flaws and strengths intimately, having worked inside the organisation for over three years (and he therefore passes the first stage of the eligibility test). Significantly, he's also untainted by any previous scandal and played no part in the controversial decisions to award the 2018 and 2022 World Cup awards to Russia and Qatar respectively. However there are those who will feel that having worked so closely with Blatter he is part of the old regime and should leave as part of a clean break with the organisation's toxic past. To be clear, Scala has not given a clear indication he has political ambition nor that he will indeed seek a nomination. But with Fifa set to make an announcement about the new election date there is still time for him to make a move. At the very least, with Jerome Valcke's future highly uncertain in a post-Blatter world, the job of secretary general could appeal to him. A Scala presidency could also be acceptable to Blatter. That's potentially significant as the level of enmity between Blatter and Platini means the former is likely to be searching for a candidate to block his arch-critic should he decide to stand. Scala's candidacy could therefore provide Blatter with an acceptable heir to his kingdom - and, as he sees it, an ideologically sound successor. This election race may be about to get even more intriguing.